Now that the weather is turning cooler here in Chicago, I have been motivated to make a few new things to keep me warm. 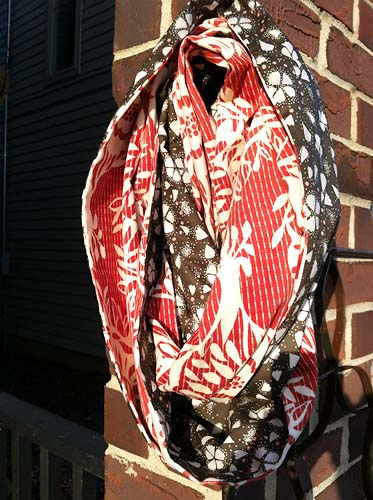 Last year, Anna Maria Horner posted a tutorial for a Figure 8 scarf. I decided to go ahead and buy one of her kits and make one for myself. The reason I bought the kit was that you need 18" x 72" of two types of fabric. So, unless you want to make 2 of the same scarf (which isn't a bad idea for gift giving), you will have left over fabric if you don't buy a kit. I had never sewn with velveteen before - it's quite beautiful and I think it would make a fabulous winter skirt. Because I was sewing voile to the velveteen, I took Jeni's advice and used lots of pins and my walking foot. This worked perfectly and I didn't have any shifting or stretching as I worked. So, after I finished and tried it on I decided I probably would prefer this scarf to be a bit less bulky for my body frame. (Although I haven't altered it yet and I am still wearing it). I think if I had it to do again, I might try 13" x 72" for each side. I wanted to make another scarf with some Nani Iro double gauze as well. But that fabric is kind of pricey and I didn't want to buy a lot of extra to get the 18" x 72" for each side, so I followed Jeni's alterations to make a thinner, longer scarf, that would be wrapped 3 times around my next. Her method only uses 2 half yards of fabric so is a bit more affordable if you don't have a kit to buy. Here is a side by side comparison of the finished scarves. You can see the first one I made is much wider, a bit shorter. The longer one is thinner and also more lightweight due to using double gauze fabric on both sides. I will say that I do feel a bit like I'm going to accidentally strangle myself when I'm wrapping that one three times around my neck. But as you can see, it is just as full as the following the original pattern. 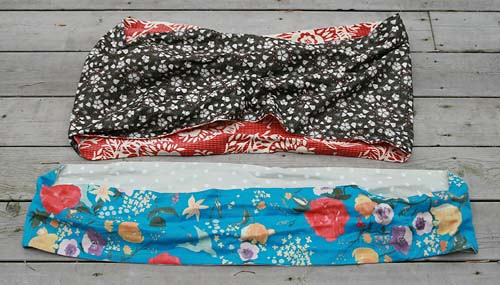 Both of these scarves cost about $25 to make and I think something handmade like this would make great Christmas gifts. My favorite fabrics overall were voile and double gauze. I may now make some lightweight scarves like I found on Flickr here, here and here.